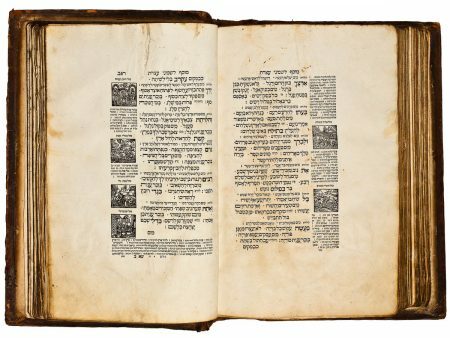 Ever since the beginning of printing, deluxe copies of Hebrew books have been issued on parchment. In the case of some incunable editions, such as the 1482 Bologna Pentateuch, more parchment than paper copies remain. After the invention of printing the reader’s “idea” of a book may have continued to be that of a handwritten volume on parchment. The durability of parchment relative to paper, and the fact that parchment was venerated as the carrier of Torah scrolls may also have played a role in the selection of this material. In the course of the sixteenth century printing on parchment became a bibliophilistic eccentricity, similar to the printing of “secondary deluxe” copies on tinted, mostly blue paper. and the originally Viennese printer Aaron ben Uri Lipmann Fränkel. Mendel Oppenheimer (1657–1721) and Samson Wertheimer (1658–1724) of Vienna facilitated the production of this, Fränkel’s second Sulzbach edition of the mahzor, as they ordered and paid for thirteen copies on parchment, for 100 thaler each. The Braginsky copy, one of these thirteen, has an ownership entry of Josel Wertheimer (ca. 1626– 1713) on both title pages. Freimann, 1911, no. 108; Hill, 1996, p. 206; Weinberg, 1903, p. 48, pp. 132–133, no. 53.